This is a sponsored post on behalf of Scott’s Pizza Tours: A Documentary. Everyone who knows me, knows I have a heart for pizza. 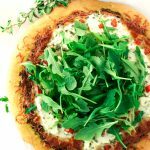 I previously shared my Margherita Pizza with Salami, and it is one of my most popular posts, and for good reason! Pizza is awesome! 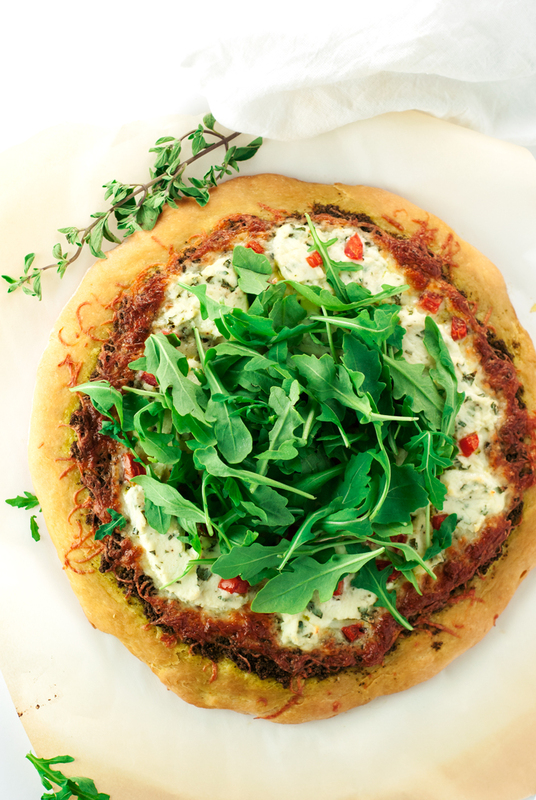 I decided to go in a different direction today and bring you an amazingly simple Walnut Pesto Pizza with Herbed Ricotta, Tomato, and Arugula, which was inspired by the Kickstarter Project for Scott’s Pizza Tour: A Documentary! I’ve spent most of my life living between Minnesota, Arizona, and Texas, and while in each state, I have spent countless hours scouring for some pizza, that although might not be considered the best ever, it’s damn delicious to me. Let’s visit one from each place! Minneapolis, MN: Pizza Luce. A once staple of late night bar hoppers downtown, Pizza Luce has since branched out, becoming popular with not only the after party crowd, but with families and tourists as well. With an enormous selection of by-the-slice pizzas, as well as full orders, they cater to all appetites and party sizes, and even offer craft beers and specialty ice creams. Try The Luce! Phoenix, AZ: Pizzeria Bianco. OK, so this one is kind of a local treasure, but absolutely worth it. Long lines included. 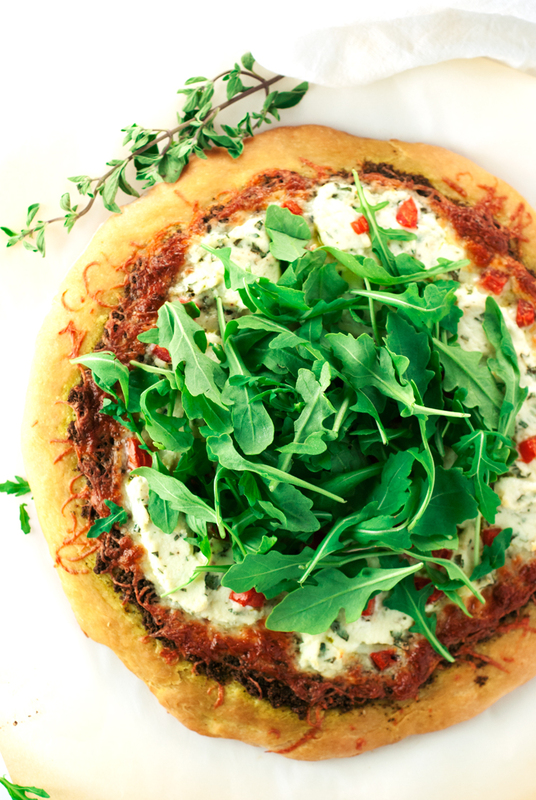 Try the Biancoverde, which is what inspired the flavor profile of my pizza! San Antonio, TX: Dough Pizzeria Napoletana. Trained by pizza makers in Italy, the owner brought back some of the best tasting pizza in Texas, let alone the world. The taste test is worth the trouble, because their margherita pizza is sensational. A must try when you’re in the city! Scott’s Pizza Tour is about a man named Scott (obviously) who is essentially the foremost authority on all things pizza. Literally, pizza is his business, in all sense of the word. Seriously, Scott sounds like the kind of guy who should be my best friend. And your best friend. Just the coolest, ever. Read more about it here, and donate to the project so we can all see it someday soon! So, now that we have an awesome documentary about pizza to watch, we should have some awesome pizza to go with it, am I right? 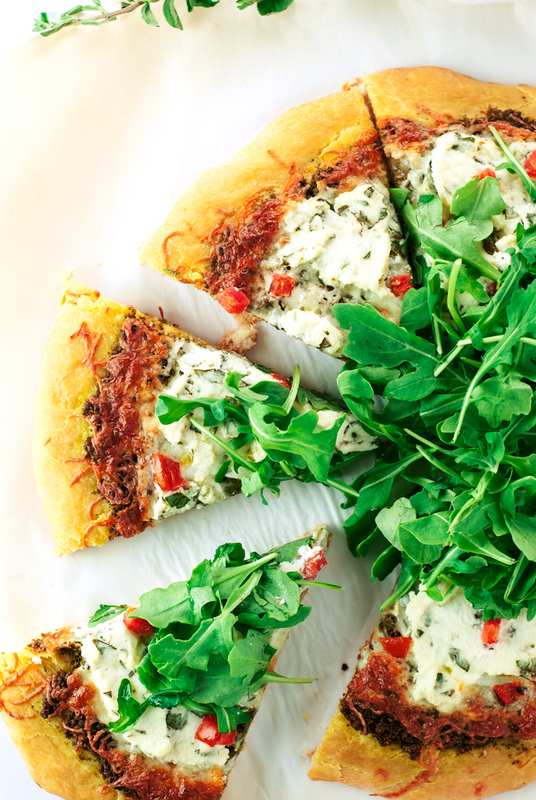 This walnut pesto pizza with herbed ricotta, tomato, and arugula is so super easy and will make the perfect accompaniment to this fun feature film! Eat up! Preheat oven to 450 degrees. In a large bowl, combine all the dough ingredients and knead with fingers until a soft ball of dough forms, and all the butter is thoroughly incorporated. Turn the dough out onto floured parchment paper and roll out into a circle about 1/4 inch thick. Set aside. Combine the pesto ingredients, minus the olive oil, in a food processor and pulse until it turns into a coarse crumble. With the processor still running, slowly add the olive oil until thoroughly combined into a runny paste. 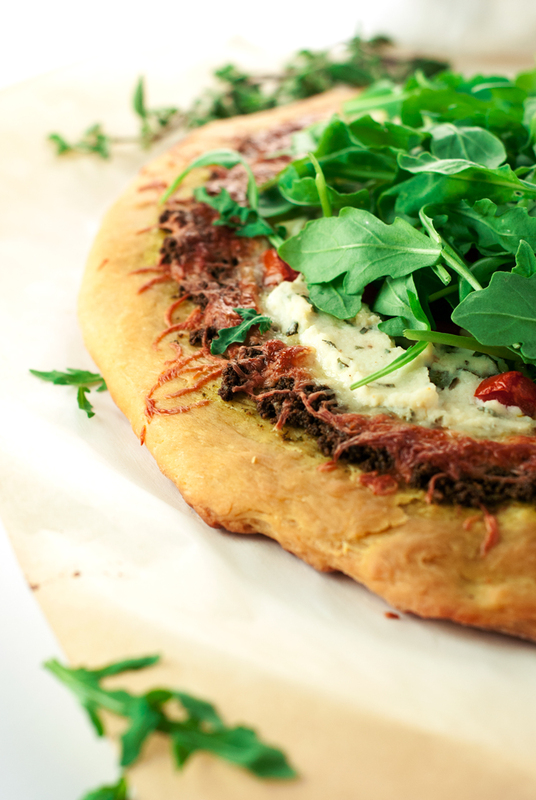 Rub the entire pizza dough with the olive oil, then distribute the pesto evenly over the pizza, leaving a small gap around the edges. Cover with the shredded mozzarella. In a small bowl, combine the ricotta, basil, oregano, honey, salt, and pepper, then drop small scoops of the mixture over the pizza. Sprinkle with the diced tomato, then place in the oven and bake for 12-15 minutes, or until the crust is a dark golden brown. 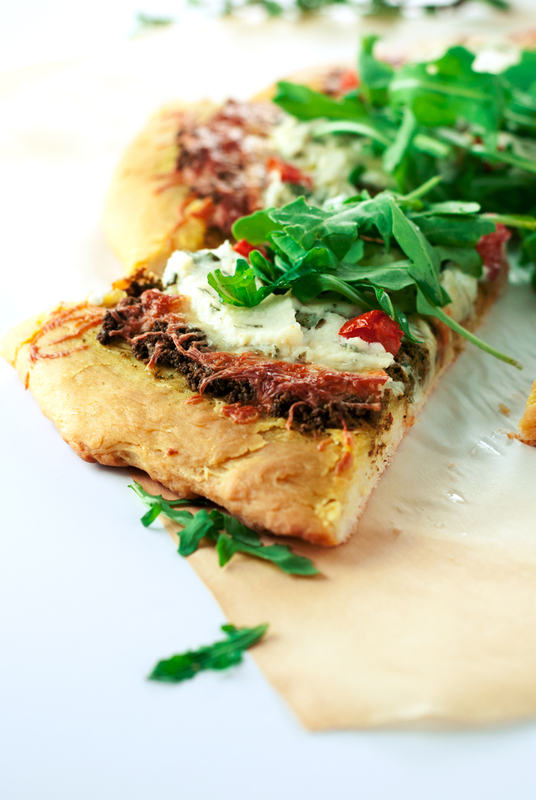 Remove from the oven, allow to cool for a couple minutes, then top with the fresh arugula, slice, and serve! Wow, I've never made pizza from scratch before, but this looks delicious so I may have to give it a shot. Thanks Karly! Will also check out the Kickstarter! That pizza looks is dabomb.com...ok that sounded totally lame. Seriously though - everything about it makes my mouth water. The next time I'm in AZ I totally want to check out that pizzeria you mentioned! Holy smokes, this looks friggin fantastic!!!! !